As sweet as cinnamon: Frosty Flakes BOM block Two. one block down, now for number two. I added lots of sparkly beads and a little bit of fancy. Drop by Robyn's blog and wish her a Happy Birthday. This is such a lovely BOM. Thanks! Oh so pretty! I just love those sparkly little beads. Sorry, been waiting all day for this and now we were out in the garden picking tomatoes........... This cool, but I'm doing it in red...wish I has some beads at DD#1's since that's where I am, they really add sparkle. Thanks Dawn this is another cute one! !Be back later with pics!! I have just discovered your BOlg, and see you're an Adelaide girl too! Thank you so very much, Dawn. 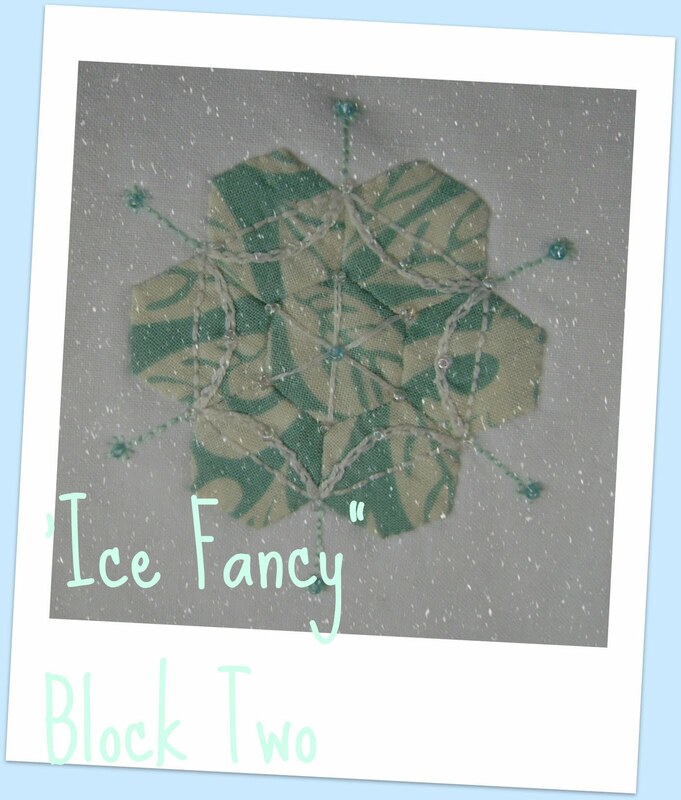 This is my very first hexagon project and I am really looking forward to making your beautiful snowflakes. Thanks Dawn... an another ooooh!! Oh Dawn....so lovely...so delicate and frosty! I love it so much! Thank you darlin'! Another 'sweet as cinnamon' design my gorgeous friend!! Oh what a lovely surprise!!! For some reason I was expecting another red one lol. This one is even prettier than the last one - if that's possible ;o)!!!??! You always show such cute blocks! I am just coming home after holiday and found your lovely new BOM. Thank you so much. Love these!! Oh so cute!!! VERY Lovely. I like your blog very much. I also like we both have 4 children. I'll be back to your blog soon, now my blogs are having a rest until my kids go back to school. From Spain Monty. I have been scared to try making hexies - this was the perfect project for me to get my feet wet. I love the little snowflakes; and I love adding that special touch with some embroidery and beading. Happy belated birthday. Thank you so much Dawn! Another beautiful block.. I could hardly believe another week has gone in. I'm halfway through my first block but will post picture when finished. Thank you again! Oh and a belated Happy Birthday!! thanks Dawn for the Frosty patterns, I have just finished no 2 and eagerly awaiting number 3. A perfect name for the sparkly little flake. What beautiful little blocks. You are so generous to share these with everyone. Have a great day! Hi Dawn, Love your Frosty Flakes. I've been following your ideas through Cyndi's makings on Stitch, Stitch, Stitch. She sent me over to say Hi. I love your colours in the ones on this post.